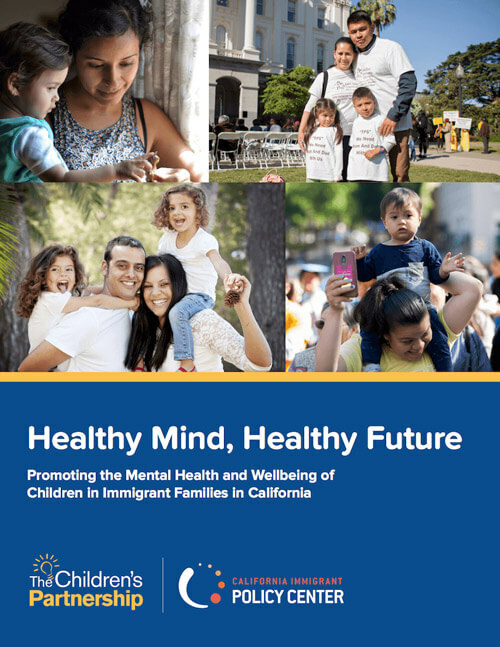 Our new report, Healthy Mind, Healthy Future: Promoting the Mental Health and Wellbeing of Children in Immigrant Families, documents our research project, including results from focus groups and surveys among immigrant families, surveys among health care providers, and key informant interviews among a variety of stakeholders throughout California. The report shines a spotlight on promising programs and practices in California that demonstrate how many schools, clinics, and community-based organizations in the state are taking matters into their own hands to help mitigate the increased fear and anxiety among immigrant families. Read our report to learn what you as an advocate, a health provider, an educator, or as a community member can do to support children in immigrant families, and visit The Children’s Partnership and The California Immigrant Policy Center for updates on our work.